Explanation: Some patches of Mars are full of mysterious tiny spherules. 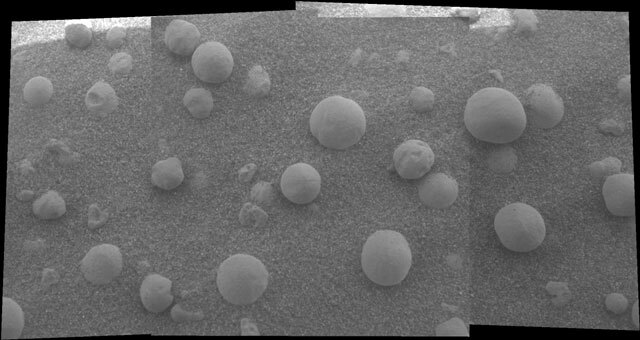 The microscopic imager on board the Opportunity rover on Mars recorded, last week, the above image showing over a dozen. The image was taken near a rock outcrop called Stone Mountain and spans roughly 6 centimeters across. A typical diameter for one of the pictured spherules is only about 4 millimeters, roughly the size of a small blueberry. The spherules appear to be much grayer and harder than surrounding rock. Debate rages on the origin of the tiny spherules, and whether their shape has to do with a slow accumulation of sediments suspended in water, or flash-frozen rock expelled during a meteor impact or volcanic eruption. A layered spherule, if ever found, would favor a water-based origin. Meanwhile, Opportunity is being programmed to dig into the Martian surface of Meridiani Planum to see what is there.